Pull off the Pacific Coast Highway, pick your spot, and spend the day on the sand: That used to be the MO for this stretch of Orange County. With almost 10 miles of coastline, it’s still a magnet for pro surfers and wading toddlers alike. The difference? The once-dingy (by O.C. standards, anyway) Huntington Beach has become as inviting as those sparkly Pacific waves. In fact, there’s a lot more to the waterfront than, well, water–like restaurants that put the average sea-shack burger to shame, miles of bike lanes, and a shopping center that serves as an open-air town square. Sure, you could still spend all afternoon on a towel, but bring a cover-up that’ll let you hit the streets in style. 9 A.M. Start off at Portola Coffee Roasters (in the gleaming Lot 579 food hall, where joe is served on tap and the croissants hail from L.A. darling Mr. Holmes Bakehouse. 10 A.M. Why crawl along in traffic when you could whiz up the coast on a bike? Rent a motor-assisted cruiser from Pedego Electric Bikes () and steer north on the paved Huntington Beach Bicycle Trail, stopping at Huntington Dog Beach () to watch off-leash pups playing in the sand. 11:30 A.M. Continue north past Bolsa Chica Ecological Reserve (), keeping an eye out for osprey soaring above the protected wetlands. Another mile-plus brings you to SeaLegs at the Beach (), an offshoot of a local wine bar that puts a chic spin on an old concession stand. Lunch on shrimp nachos, then plant yourself on a lounger before returning south. 1:30 P.M. Take a break from the sun with a Ginger Renewal treatment at Aarna Spa () in the two-year-old Pasea Hotel. After being exfoliated, massaged, and wrapped, hit the eucalyptus steam room. 4 P.M. Down the street, Pacific City () mall specializes in Surf City USA’s second-favorite sport: shopping. 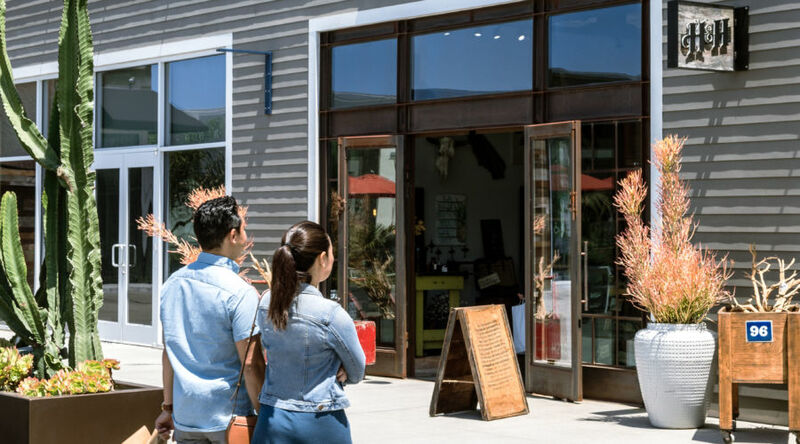 An open-air design and palm-lined walkways lure visitors to SoCal faves like Irene’s Story (), a trendy boutique with boho jumpsuits and dresses, and Heirlooms and Hardware (), a rustic home outfitter where Joseph and Jessica D’Ambra share original designs and antique finds from their travels. 6 P.M. Enter swanky Bluegold and proceed to the back room, where 30-seat LSXO () serves Vietnamese favorites by chef Tin Vuong of the much-loved Little Sister outposts. Studded with pork belly and prawns, and served with bean sprouts and greens, the crunchy rice-flour crepe is so good you’ll forget to Instagram it. 7:30 P.M. End back at Lot 579, where Popbar () serves up gelato, sorbet, fro-yo, and more. After all, it wouldn’t be a day at the beach without an icy treat. PERFECT NIGHT Across the street from the waves, the renovated Kimpton Shorebreak Resort offers beach supplies, a daily wine hour, and s’mores around the firepit. From $209; .